Neomi Rao's extreme beliefs regarding LGBTQ equality, race, and sexual assault survivors should immediately disqualify her from consideration for the DC Circuit Court of Appeals. Rao's inflammatory writings prove she would be unable to serve impartially on the federal bench and as a result I urge you to OPPOSE her nomination. President Trump’s nominee for the DC Circuit Court of Appeals, Neomi Rao, is -- unsurprisingly -- another extreme, out-of-touch nominee. Rao has a disturbing record on LGBTQ, race, and sexual assault. In her writings, Rao has placed blame on sexual assault survivors, questioned the legitimacy of LGBTQ equality (calling it a "trendy political movement"), and lamented multiculturalism. 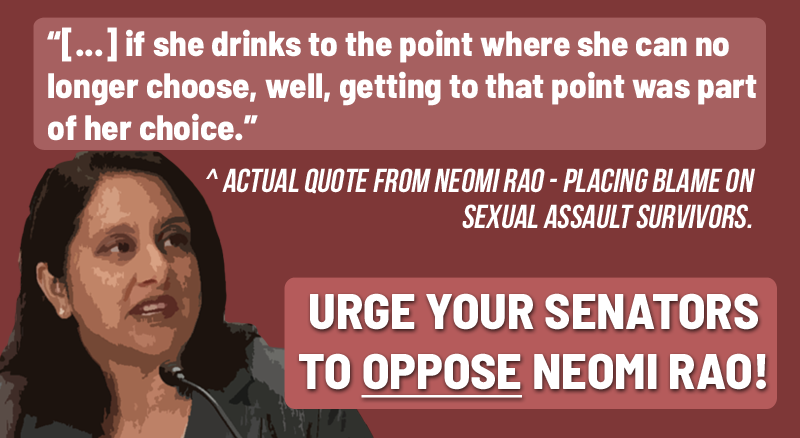 Tell the Senate that Neomi Rao's bigoted views have no place on the federal bench and they should OPPOSE her nomination!